Removed from a working TV distribution system a short while ago. DESCRIPTION of Antiference 8 Way TV Amplifier with Bypass (F-Type) Manufacturer: Antiference UK. Mercury AMD08 4g Ready 8way VHF/UHF Distribution Amplifier With DC Pass. Condition is New. Dispatched with Royal Mail 2nd Class. 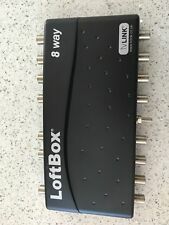 Slx 8 way signal booster for tv/fm/dab distribution. It is full HD ready and filters 4g. Gives an 11db gain per receiver and is red compliant. Distribute TV aerial output to up to eight TV's without signal loss. It has the capability to be able to combine all these signals onto one feed designed to go to the main sky/Sky /living room location. DDU distributes UHF, FM,DAB, Sky/Sky and CCTV to the main TV. Specific DDU outlet available (see below). Optima 8 Way TV Masthead Variable Gain Amplifier Booster. Triax DDU 8 Way Domestic Distribution Unit 6 2 1 Sky / TV / DAB I Bought a while back, but never got around to installing it, so it’s been sitting around in a cupboard for a while and now needs to go to make some space. This is part of a clean out so please have a look at all the other items I have listed too. Dispatched with Royal Mail 2nd Class. Alternatively this amplifier may be used as a traditional aerial distribution amplifier without making use of the infra-red bypass capability. 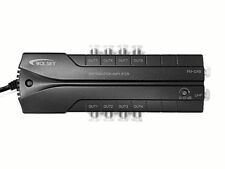 Separate inputs are provided for UHF TV (470-862 MHz) and for VHF/FM/DAB (47-300 MHz, UK and Ireland). 4G/LTE and short circuit protected. Mains powered. Screened housings. Distribute TV aerial output to up to eight TV's without signal loss. Improves your TV picture especially in poor reception areas. Flat gain response across full frequency spectrum ensure optimum digital reception. LTE filter fitted. Short circuit protection on each output. Easy to mount fixings. Add to Favourites. We Accept Only. Mains powered. F Connectors. Screened housing. A built-in LTE filter is included to eliminate 4G LTE interference. LTE Protected. As well as splitting an input signal to eight outputs, it can be used as a signal booster. It is also compatible with TV-Links (Magic Eyes). 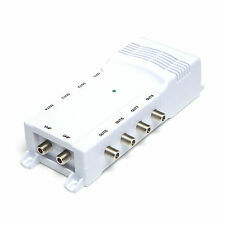 Compatible with DigiLink eyes for channel changing in extra room. No power required at the amplifier. All ports IR enabled: 9V 15mA short circuit protected. Max output level (IMA3-60dB). EN50083-5: >76dBuv. 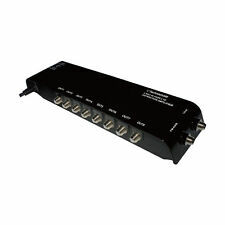 8 way uhf/vhf t.v distribution amplifier for use with up to 8 t.vs. Built in low noise amplifier with wideband output. Built in surge and short circuit protection, and maximum output limiter prevents overload. Full Gain Output: 20dB. Gain per Split: 8dB. Colour: Black. VHF: 47-230 MHz. A built-in LTE filter is included to eliminate 4G LTE interference. UHF: 470-862 MHz. LTE Protected. As well as splitting an input signal to eight outputs, it can be used as a signal booster. 4G filtering on dedicated DTV input to reduce interference. We will do our best to turn any less than satisfactory experience into a positive one. Our service and products are of the highest quality! In weak UHF signal areas, or where a long downlead cable is required, it may be desirable to use a masthead preamplifier mounted close the UHF antenna. These multi-way amplifiers feature built-in 12V line powering on the UHF input; there is no need to use a separate power unit for the masthead amplifier. SKU : 007285. Separate inputs for VHF and UHF. Built in low noise amplifier with wideband output. 4G READY VHF/UHF DISTRIBUTION AMPLIFIERS WITH DC PASS. Distribution amplifiers with built in 4G LTE filter, designed to improve the quality of audio and video by amplifying weak VHF/UHF signals and distributing them across a designated area. Distributes HD TV, DAB and FM signals. 2 Inputs - 1x TV signal and 1x DAB/FM. 10dB Gain ideal for long cable runs or weak signals.